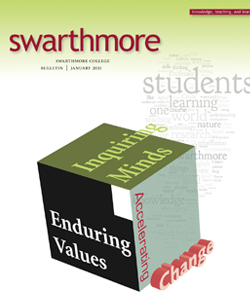 Thank you for including the historic Dennis Farm in the thought-provoking October Swarthmore College Bulletin (“Rock and an Old Place”). When I was a student at the College, we talked a great deal about “consciousness raising” and now the Bulletin has helped raise the readers’ consciousness about urgent environmental justice issues. The environment is indeed as much an ethical, social, and spiritual issue as it is a scientific and economic one—and it deserves to be approached from each of these perspectives. I appreciate the need for alternative energy sources and favor progress—but progress that doesn’t do more harm than good. Before we as a national and world community continue to pursue natural gas, serious risk assessment and cumulative impact studies on the long-term effects of horizontal hydraulic fracturing need to be done. The gas and oil industry is now wreaking havoc on the Marcellus Shale region and the citizens who live there, as it has done in developing countries whose natural resources they covet. Private, tax-paying landowners in Pennsylvania are regarded by the industry as nothing more than inconvenient obstacles to be either bought, forced to lease, or have gas extracted from beneath their property without their consent. I frequently remind myself that my free black ancestors on the Dennis Farm in Susquehanna County, Pa., lived through worse. After all, in 1793, the year they moved to Pennsylvania from Connecticut, Congress passed the first Fugitive Slave Act that placed not only fugitive slaves but free African Americans at risk of being kidnapped. In 1837, the Pennsylvania Supreme Court disenfranchised black men who, since the American Revolution, had had the right to vote in the Commonwealth. They could not vote again until 1870. Northeastern Pennsylvania was a fervent center of abolitionist activity. Today, my fellow landowners upstate are white, but I’ve told them that if the region could help end slavery—another immoral industry disguised as an economic necessity—we can push back against the gas industry too.